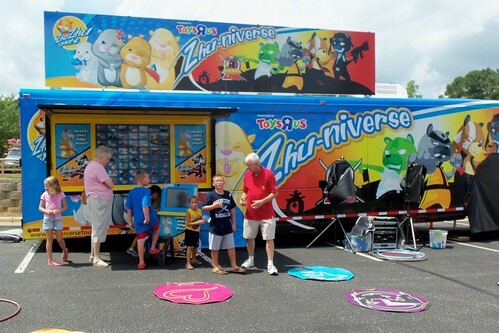 On August 18th my daughter and I drove up to Cary, North Carolina to check out the Zhuniverse Tour. If you don't have children under the age of twelve, or if you've been living under a rock, you might not have heard of Zhu Zhu Pets. They are adorable hamster-like critters. They run on wheels and each one makes 40 different sounds. The Zhu Zhu Pets make a different sound depending on where they are. If the Pets are in one of their accessories they will make a noise to match it, like honking if they are in the car. My daughter has wanted a hamster for years so when Zhu Zhu Pets came out they were a perfect compromise for us. When we were invited by NC Blog Buzz and Mom Select to check out the tour, we were both excited. We both wanted to see what's new in the Zhuniverse, and I am always thrilled to see my blogging friends. I have been so fortunate to get to know several incredible women who blog that live in North Carolina. The Zhuniverse tour gave us a chance to catch up, too! It was a very hot day in Cary and thunderstorms kept threatening. I was afraid they wouldn't be able to set up their stuff, but the weather held off long enough for some play time. 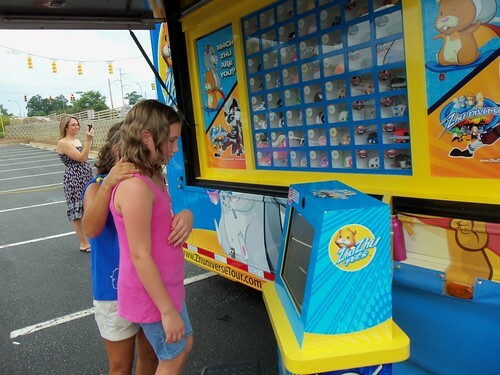 They had an Interactive "Which Zhu Zhu pet are you?" We had a great time playing at the tour! One reason I really enjoy it when a company does a tour like this is that you have a chance to let your child try out the product before you buy it. 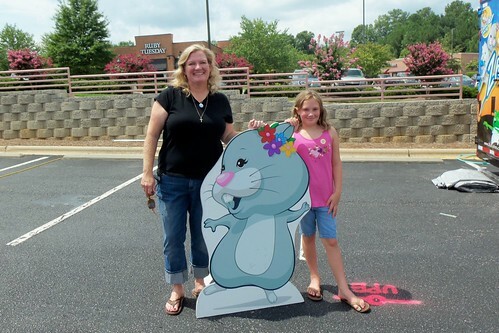 The kids there were having a great time with all of the Zhu Zhu Pets. It was also pretty cool to see all of the accessories that are available and how they work together. I like that you can buy one Zhu Zhu Pet for a reasonable price, (under $15) but you can also expand your collection however you like. 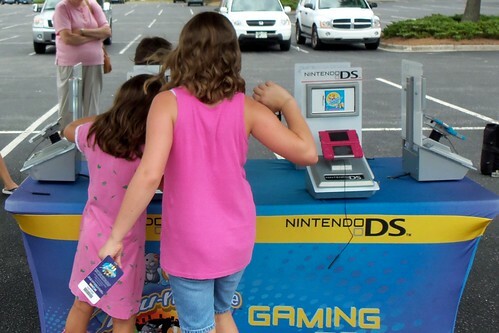 Of course my daughter immediately put the DS game on her birthday list! All photos included taken by Amy Hodges. 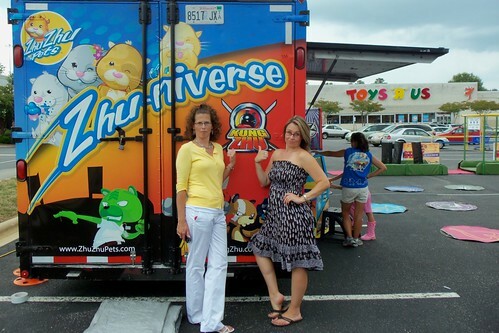 I received an invitation to the Zhuniverse Tour from NC Blog Buzz and Mom Select. I received a gift for my participation. I am grateful for the gift, but any and all opinions expressed here will not be influenced by gifts/compensation. For further information please see my disclosure page. I took The Dudes to this when it came to Baltimore. 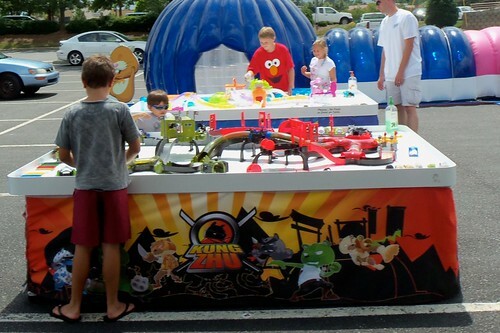 It was so hot that day I think all of the Zhu Zhu Pets were dead! I kid. They were alive, I just told The Dudes they were dead so they'd want to stay in air conditioned area! More kidding. It was actually fun despite the mind blowing heat. Stopped by to say hi from the Bloggy Boot Camp list. Can't wait for BBC Philly!